Mine were the helping hands available during the summer months when it was time to make the day's supply of bannock. We ate bannock and blueberry jam for breakfast, bannock with a slice of meat for lunch and more bannock to wipe up the gravy that was often part of our evening meal. When Mom went to the store for flour it was for a twenty pound bag - maybe two. As I got older it was again my helping hands that carried the second bag of flour. enough water to make a soft dough. . . a cup, more or less. Then mix everything together and pat it into a circle that's about an inch thick. Bannock can be cooked slowly in a well greased cast iron frying pan or dutch oven over coals or fried. To fry, heat up a half inch of of oil, lard or bear grease in a cast iron frying pan and lower the dough in carefully. Fry until the underside is golden brown then turn over and cook the other side. . . it's OK to peek, just don't burn yourself. You can also cut the dough up into six or eight pieces and pat them into little circles and cook them individually. Nothing to it. Some folks also call the latter fry bread but our fry bread was slightly different. When we were short of baking powder we made fry bread instead. Mix flour, a little salt and some water to make a soft dough. Knead it a few times and let it rest while you heat ¼ cup of oil or lard in the bottom of a frying pan. Tear off a ball of dough, roll it in your hands and then stretch it to a half inch thickness. Lower it carefully into the hot oil and fry until a golden colour. Keep watch because it won't take long. 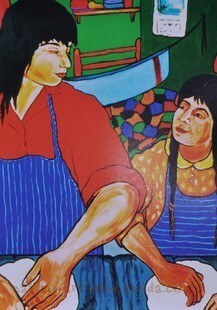 Then turn the fry bread over with tongs and do the same thing with the other side. Drain on paper towels and sprinkle with sugar or spread with jam... my favourite is blueberry jam. They call the result Elephant Ears at the Canadian National Exhibition in Toronto and charge you big bucks. Here's some more stories by Nokomis. . .